What about non-profit charitable organizations? Although their objectives are not to generate a profit or provide its stockholders with a dividend, they must look into the future to increase its service to the communities it serves and find the necessary funding to support those services. Their ultimate success may not be defined as business success, but is measured in the effectiveness of their humanitarian service. Stripped of profitability goals and materialistic rewards, these organizations face enormous challenges in focusing their efforts and motivating those involved. Leaders and managers of non-profit organizations have learned the benefits of developing and implementing a strategic plan. We have participated in these organizations and watched how the process has transformed good organizations into great organizations. Our roles in these transformations were either as the facilitators of the process or leaders with the organization. The need is great and the results are significant. What constitutes a typical leadership structure in a non-profit organization? What effect does strategic planning have on the function of a board of directors? What effect does strategic planning have on the staff, both paid and volunteered? How is a strategic plan best developed and implemented? It is important to note, that when discussing non-profit organizations, a wide range of entities must be included. Local charities that might help the homeless or those with disabilities, churches, clubs such as Rotary or Lions, YMCAs, and scouts are all included in this category. It has been our experience that there are two general organizational cultures within non-profit organizations. The first culture is one driven by a single leader, usually the founder. This individual has identified a need in the community and is passionate about addressing that need. The second model is usually a more well-established organization. The founder may no longer be involved and leadership comes from the board of directors. These people are passionate about continuing the service being provided. Let’s call the first culture the founder-driven culture. One might characterize the leader of this type of organization as the charitable entrepreneur. He or she is the visionary. They have a picture of what can be. In the earliest stages of their planning, they realize they can go it alone. They need to solicit others who can bring to the developing organization one or several of the 3 W’s (Wealth, Wisdom, and Work). The founder is looking for followers who believe in the vision and will act as an extension of his own efforts. These people may possess or have access to the wealth necessary to fund the effort. They may have a skill or knowledge necessary to develop the organization such as publicity or grant writing. Their network within the community may be strong or they are simply hard workers. In the founder-driven culture, leadership comes primary from the founder. He or she has the vision and is totally dedicated to its achievement. They look of others including the board of directors as followers. They can help but don’t interfere with the work the founder has to do. Most decisions are made by the founder and supported by staff and board. Conflict develops when the followers do not agree with the founder’s actions or decisions. These relations continue through the early years of most non-profitable organizations. The second culture may be called the board-driven culture. This organization is one with a history and that history may include the departure of the founder. That is not to say that the organization is without operational leadership. That role is usually provided by an executive director who was hired by the board to manage the daily operation of the charity. In this situation, leadership can come from either the executive director or the board. These are often organizations such a Chamber of Commerce, a Red Cross Chapter or a local Rotary Club. Regardless of the organizational culture, the most critical part of the strategic planning process is the beginning with the development of a Vision and Mission for organization. The Vision is a statement of nouns. It is how the organization is to be perceived by the community. What is its role? What is its value to the community? The Mission is a statement of verbs. What will the organization do to achieve its Vision? How will it be funded? What skills must it incorporate? How will it be staffed? If you ask everyone in the room at the start of this process if they understand the purpose (Vision) and workings (Mission) of the organization, you should receive an overwhelming positive response. But in the process of defining those statements on paper, there will be much disagreement and possible conflict. We once worked with a management group, who had been working on developing a Mission Statement for over one year. Every week they would leave their meeting with a written statement, yet a week later someone would find a point of disagreement requiring a revision. The agreement reached on these two steps by the board and organization leaders produces a more focused effort by all involved. People who join non-profit boards are good-hearted committed people, but for the most part they are uncertain in their roles. As the planning moves through the identification of critical goal categories, goal writing and action plans, the needs for individuals to take responsibility for specific assignments develop. At this point, board members can take on responsibilities or serve on a committee assigned with a specific task. Oh, I would love to work on the website. I would be glad to be on the financial committee. We would like to work together on a monthly newsletter. The completion of a strategic plan also provides greater structure to the board meeting. 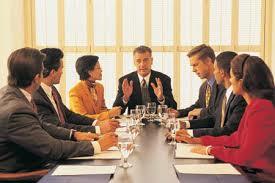 In smaller and newer organizations, board meetings spend time on what will later become committee business. Discussion may include where to get tickets for an upcoming even printed or what the food at the next fund raising dinner will be. These decisions are best performed by individuals and committees not the board of directors. The board’s role becomes focused on the implementation of the strategic plan, issues which may arise and revisions when necessary. Individuals and committees should be asked to report progress at the board meetings on a regular basis. This provides the organization with feedback and control. Board meetings become more meaningful and of a shorter duration. Our observations consistently show that individuals who work in non-profit organizations are both dedicated to the organization’s purpose and hard working. They are either volunteers or are compensated at levels below what would be expected for similar work in the for-profit world. With good leadership, they will perform at the highest levels. With poor leadership, they will perform poorly, develop unproductive conflicts and eventually sever their involvement in the organization. Good leadership is greatly enhanced by a strategic plan and its implementation. Working with a strategic plan minimizes conflicts which might arise between the board and the staff. It also provides opportunities to acknowledge the success of individuals and groups of staff in the achievement of goals. Recognition is a key to business success in that it increases morale and improves performance. Who should participate in development the plan? How long will it take to develop a plan? Who should facilitate the plan development? The length of time required to develop a plan varies. It should not be a never ending process, but cannot be done in one meeting. Time between sessions is necessary to reflect on what has been completed and the next step. Assignment or homework needs to be assigned to those drafting the plan to be completed before the next session. Some would like to develop their plan in a half day or full day retreat. Two half-days is preferable toa one day session. Regardless, outside work prior to the sessions and homework between the sessions is important. The planning sessions need to have a facilitator who is experienced and from outside the organization. Strategic Planning is not a new process. Over the last 50 years many business managers have implemented the process for either a business or non-profit organization. There are many books, tapes and computer software available to explain the process. There will be those on your board who believe they can facilitate the organization through the process. They may even be experienced facilitators, but they may be too close to the subject to ask the right questions. Good facilitators ask good questions and an outsider has fewer prejudges. There is usually reluctance by the board members to spend money employing an experienced facilitator, but the cost of an ineffective plan or not getting everyone involved can be considerably higher. Find a facilitator you trust and discuss your budget. Some outside involvement and guidance is better than none. A complete program with an outside facilitator will provide the best return on your investment. RLS Focused Solutions has assisted non-profit organization, their directors and staff develop and implement strategic plans which assure strong leadership and success. It all starts with just a short discussion. Please email bob@plangoals.com or call (910) 575-1286 to start a conversation.